Tis is a favourite at our home esp at BBQ parties, from big to small all r potato lovers so I made a healthier version to eat guilt free of tis yummy creamy salad. In a bowl combine the star items & mix to a creamy texture. Add in the Potatoes and eggs and mix in the dill or spring onion. Mix all well to coat all the ingredients and chill for 2-4 hours. Serve with BBQ's or roasts or what ever you like it with. Good One..!!! I am vegeterian but i will try for my friends......thanks a lot for sharing!!! 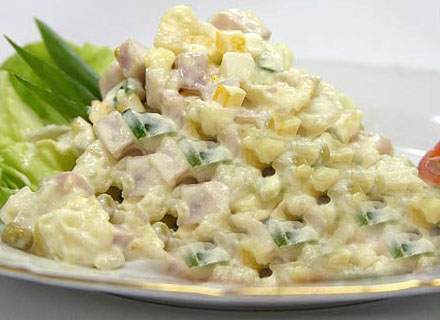 This seems to be a more yummy version of the egg and potato salad that i regularly make!! Will definitely try this version the next time. Thanks Rabz!!! Thanks once again Swati & plz let me know if u have liked te salad. Cheers. hi rabz,thanks for wonderfull salad recipe will surely try. Just don't forget to chop ur eggs and mash your potatoes a little before mixing it in. Cheers & enjoy.